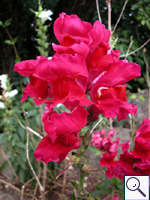 One species of Antirrhinum, Snapdragon (A. majus), is recorded in Britain. Four British miners are recorded on Antirrhinum. A key to the European miners recorded on Antirrhinum is provided in Bladmineerders van Europa. 1a > Leaf-miner: A distinctive mine primarily above mid-rib, with irregular short lateral offshoots into leaf blade. Pupation external (Spencer, 1972: 51 (fig. 172), 55; Spencer, 1976: 270, 271 (fig. 486)). Polyphagous. On more than 40 host genera in 15 families, but not yet on Antirrhinum, in Britain,. Widespread throughout Britain. Also recorded in the Republic of Ireland. Widespread in continental Europe. 1d > Leaf-miner: Mine linear, whitish, both upper and lower surface. Pupation internal, at the end of the mine with the anterior spiracles projecting through the epidermis (Spencer, 1976: 433). Two highly polyphagous species of Chromatomyia, with indistinguishable mines, have been recorded in Britain. These are syngenesiae (Hardy) and horticola (Goureau, 1851) which can only be distinguished by the male genitalia. Both species are widespread in Britain and elsewhere, although syngenesiae is almost entirely restricted to Asteraceae. Records on Asteraceae not based on examination of male genitalia are treated in this account as Chromatomyia 'atricornis'. 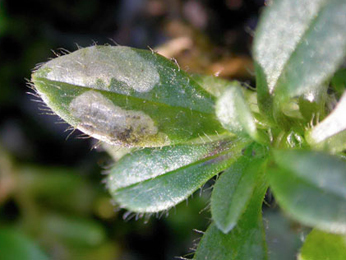 Chromatomyia horticola is recorded on 160 plant genera in 31 families of which 55 plant genera in 19 families, including Antirrhinum, in Britain. Also recorded on Antirrhinum elsewhere. 1e > Leaf-miner: A short, irregular, linear upper surface mine on any part of the leaf. Also recorded from young pods (Bland, 1997a). Polyphagous. On 119 plant genera in 31 plant families of which only 4 plant genera in 2 plant families, but not yet on Antirrhinum, in Britain. Local, probably introduced to Britain. Widespread in continental Europe particularly in Botanical Gardens and glasshouses. Also recorded in Egypt.